In very good condition. Used in Islamabad/Rawalpindi only. All token taxes are paid to date. Petrol driven, CNG never installed. Contact: +923315287070 In very good condition. Used in Islamabad/Rawalpindi only. All token taxes are paid to date. Petrol driven, CNG never installed. 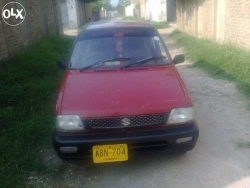 No work Required, Computerized Book, Red Color, Karachi Registration, Out class condition neat and clean car. 2nd owner, verify the mechanic then purchase, in family Use. CNG fitted. Complete Return file. No accident. Vehicle is in very good condition and excellent in mileage No Accident or damage original color an body. In genuine condition and mint condition. No major or minor accident. 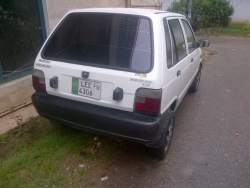 Mehran 2010 Grey Colour Lahore Number AC/CNG 100% orginal Grey Colour use only for pick and drop from children's school. life time tokan paid very work to done . 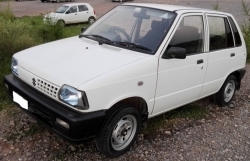 This Suzuki Mehran 2005 is a steal at just Rs350000. It has 92000km on the clock and comes with a Manual transmission system as well as other great features. You will be hard pressed to find better value for your money elsewhere. Lush condition. Like a new car. Pumper to pumper original. Urgent sale. 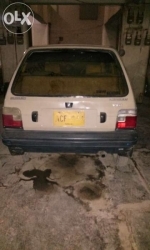 Army officer maintained car and in Genuine/ original condition... Maintained only by suzuki motors.. Bumper to bumper genuine and for imediate sale..